I thought for sure that I'd love this cereal. I love the Cinnabon store at my local airport. I can think of nothing better than getting up for an early flight and treating myself (financial and dietarily) to a sticky, gooey, decadent, Cinnnabon roll. I sit in a chair in the busy airport terminal and lick my tasty cinnamon fingers, smiling as as the frantic world rushes around me. 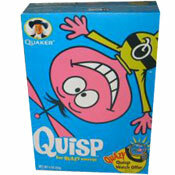 The packaging of this cereal gives you every indication that you're in for a sweet, sinfully-good breakfast experience. The sweet roll shaped cereal pieces bulge from the box in front of a backdrop of delicious, icing-covered Cinnabon rolls. On the back corner of the box, two Cinnabon rolls are shown with so much icing that pools of sugary glaze are beginning to form around the bottom of the rolls. It pains me to tell you that this cereal offers nothing in the way of a Cinnabon experience. I know they're not going to pack the box with gooey, delightful sweet rolls, but at the very least I was hoping for a treat... something that reminded me of a sweet roll. That's not the case. The cereal pieces have a very whole-grain flavor - very wheat-y and slightly nutty. The saddest aspect is the cinnamon flavor. For all the text on the box touting it's exclusive Makara Cinnamon, the flavor of the spice is more of a burnt-cinnamon. If you could divide cinnamon flavors into a fun kid-friendly cinnamon category and a health-conscience, serious cinnamon category, this would fall under the serious side. It's almost as if they've removed the fun from cinnamon. For a better cinnamon flavor experience, go with Cinnamon Toast Crunch (or it's Malt-O-Meal knock-off Cinnamon Toasters). There are a couple positive things to mention: This cereal stays crunchy in milk for a long time. As for nutrition, people might see the box with it's frosting-covered sweet rolls and immediately think they're looking at a dietary nightmare. In fact, this cereal is a moderately decent choice when it comes to nutrition. A 1 cup serving has only 150 calories and 1.5 grams of fat (0 grams saturated; 0 grams trans). Each serving has 3 grams of dietary fiber, 3 grams of protein and a semi-respectful 10 grams of sugar. Also see the review for Cinnabon Caramel Pecan Crunch. The $0.00 dollar amount paid is because the cereal was sent to MrBreakfast.com by the company. I wish I could have given them a better review. 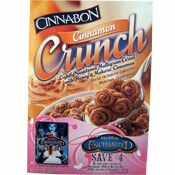 What do you think of Cinnabon Cinnamon Crunch? Disappointing indeed. Will not buy again. Yes the wood analogy is close. Bland taste at the start and then has a weird cardboardrd/woody taste at the end. Would definitely say NO to this ever ever again! Too bland. No cinnamon taste whatsoever and it tastes like wood. No wonder why it was so cheap. Buyer beware. Worst cereal I've ever eaten. This is the only analogy I could come up with, so sorry for anyone who's not Catholic: It was like burnt communion wafers with cinnamon on them. It dissolves in your mouth like a communion wafer and is impossible to chew. Very strange. Can't finish one bowl of the stuff. Not good... t was way too hard. it didn't taste gross, but I will never eat it again. I don't like this at all. I doubt we'll finish the box. Taste like wood chips more than sweet rolls. Very disappointed.